Another interesting GTW entry this time which has information collaborated from Fabrizio and also Bonaventura Di Bello, famous co-founder of Brainstorm Enterprise. 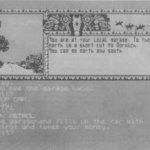 Death Workshop (Also known in Italian as La bottega della morte) was to be a text adventure game which first was being written as a storyline with hand-sketched illustrations. Death Workshop was to be written in The Quill, and may have even had some of the story scripted out at somepoint. It is believed that the story was actually completed and a good section of the game sketched out, but it is unknown why the game never quite made it out. We hope to find out more on that front soon. There has been recent discussions about taking the stories and completing the games in a package such as "Inform". But its early days. It is not known if at any point soon we may see some of the C64’s remains. We are hopeful, but the programmer must be located (and whom the name has escaped everyone sadly).